Basic Algebra Review: solving linear, quadratic and simultaneous linear equations, percentage problems; Trigonometry: definitions of trigonometric functions in a right triangle and the unit circle - relevant applications; Plane Geometry: definitions and relevant applications using regular and irregular polygons; 3-D Geometry: definitions and applications using solids with an emphasis on solids intersecting each other. Math 12 Pre-Calculus or equivalent OR BCIT Math 0001. Solve different types of equations (equations with fractions that lead to linear equations, quadratic equations, or equations with roots); systems of linear equations. Solve problems involving percentages in applications of building technology. Use the trigonometric functions in solving building technology applications. Determine the length of arcs (portions of circles) and areas representing sectors of circles. Solve problems involving ratios, proportion, and variation. Solve technology - related problems involving plane geometry and three-dimensional geometry (and combinations of geometry and trigonometry). 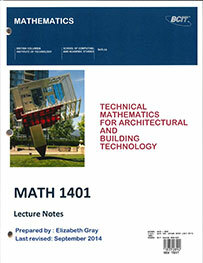 Interested in being notified about future offerings of MATH 1401 - Technical Mathematics for Architectural and Building Technology? If so, fill out the information below and we'll notify you by email when courses for each new term are displayed here.